Pather Panchali, the first film of Satyajit Ray’s ‘Apu Trilogy’ explored the childhood experiences of its protagonist Apu and the trials and tribulations that had forced his family to leave the small village of Nischindipur. Aparajito continues Apu’s journey from the end of Pather Panchali – it portrays his stepping into adolescence and finally his complete break from his roots to become his own man. 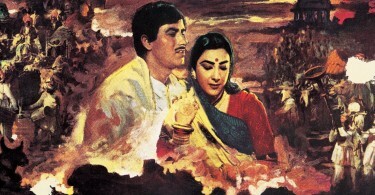 The central theme of the film is conflict between Apu’s quest for independence versus his mother Sarbojaya’s possessive love and her want for stasis and security. Aparajito is a film in three distinct acts and a resolution. The first depicts the life of Apu, Harihar and Sarbojaya in the holy city of Varanasi where Harihar, a Brahmin ekes meagre a living reciting shlokas to widows and dispensing ayurvedic medications to the poor. Apu is happy; he doesn’t have to go to school and spends his days in a carefree manner playing games with his friends in the narrow lanes of Varanasi, slipping through the legs of a huge bull or gaping in awe at pehlwans. The family is still poor but Harihar seems to have overcome the series of shocks that forced him to leave his village. But Sarbojaya, who spends most of the time indoors in the suffocating house, is the one who is scared and diffident. It is through Sarbojaya’s isolation and edginess the film reveals the consequences of leaving the village and relocating in an urban set-up. Her helplessness is manifested through her encounters with the monkeys at the water tap and the lecherous advances of their neighbour Nandababu – a character who has visual similarity with a monkey. Yet despite all the problems there is a modicum of stability and better prospects and the film brilliantly portrays this sense of optimism through little details like Sarbojaya providing extra bit of milk for her husband and a sick Harihar thinking about getting a better accommodation and putting Apu in school. The film uses the city of Varanasi with it’s the majestic ghats, the dingy lanes, the murals and the temple rituals – common images which seen through the eyes of a master filmmaker assume a monumental quality – as a backdrop to this subtle human drama. The optimism is cut short by Harihar’s death – a death portrayed without any melodramatic excess. A cut from the close-up of the dying Harihar to a flock of pigeons taking flight acts a poignant metaphor of release of a humble, religious soul. The next shot of Apu being wrapped up in the funeral clothes on the banks of the Ganges expresses his stunned incomprehension about the magnitude of the tragedy that has occurred. Sarbojaya now becomes the dominant figure in the film and naturally so – as a widow with a young son she becomes the strong and dedicated mother. Swallowing her pride she takes up the job of a cook in the household of a rich family. But the moment she realises that her stability would undermine Apu’s future she decides to take up the offer of her uncle Bhabataran and return to Bengal. A swish pan from the pained face of Sarbojaya after she sees Apu lighting the hookah of the zamindar to the wheels of a steam engine accompanied by a rousing sitar melody signals the beginning of the second act of Aparajito. The transition is conveyed through the train journey back home – a classical montage sequence of the changing landscapes shot from the train window. As soon as the scenery of Bengal appears Ray uses his first reference toPather Panchali – the haunting theme music of the film fades into the soundtrack signifying a welcome and start of a new life. The film enters a higher dramatic scale in the third and final part when the adolescent Apu passes his school-leaving examinations with flying colours and earns a scholarship to study in Kolkata. Sarbojaya’s pride in her son’s achievement clashes with her concerns for her own welfare and the realisation that her little son is a no longer a child but a young man with his own ambitions and dreams. In one of the most emotionally intense moment of Aparajito, Sarbojaya slaps Apu and then instantly like the ever-sacrificing archetypal mother atones for her act by offering Apu her last savings for his studies in Kolkata. 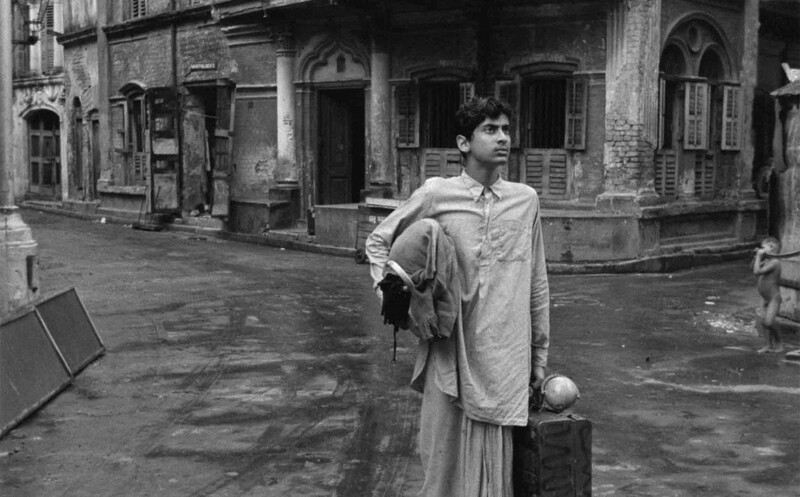 The first parting scene reflects Ray’s mastery in handling extreme emotions with restraint and economy – Apu leaves home, carrying a symbolically significant globe and walks to the train that will carry him to college in Kolkata. Ray captures the brave smile on Sarbojaya’s face as she waves good-bye; when Apu’s back is turned, the smile disappears and her face grows tense with the fear of loneliness. Apu in Kolkata symbolizes the fundamental dislocation of youth. His discovery of the charms of the big city – beginning with electric light in his living quarters – and the imbibing some of the moral laxity of an urbanite through his growing camaraderie with his city-slicker friend Pulu – casually munching peanuts, bunking classes and whistling tunes – act as signifiers of his increasing comfort with the life in Kolkata and the emotional distance with the life in Mansapota and his mother Sarbojaya. Apu is caught up in the quintessential dilemma of an adolescent – the realisation that growing away from one’s roots implies sacrificing a bit of one’s soul. InAparajito, the evolution of Apu’s detachment is brilliantly depicted in the two scenes concerning Apu’s vacations. When he first visits the village a bored Apu decides to leave early although Sarbojaya would have loved to him stay back; the moment the train arrives, he realises his folly and so comes back home in a hurry and lies down with a happy relaxed smile. Later, with his exams looming and with his mother’s health deteriorating (though Apu is unaware of the fact) he decides to ignore her pleas to return for the Ganesh Puja. Apu feels guilty. The atonement – money-order his bonus pay to Sarbojaya. Aparajito, although being the second film of Satyajit Ray’s ‘Apu Trilogy’, is an independent film in itself – the two ‘quotations’ of the theme music of its predecessor do not require previous viewing of the first film and stand on their own as imaginative use of background music. However, for those who have seen Pather Panchali, Aparajito is the perfect sequel. In the film the timeless tale of growing-up and the ensuing dissonance between personal independence and abandonment of the loved one is masterfully portrayed by the classically structured screenplay that abstains from melodramatic excesses for a lyrical, minimalist style in order to explore the psyche of its main protagonists. Technically the film is excellent with Subrata Mitra’s cinematography shunning plasticity thus brilliantly complimenting the director’s vision. Mitra’s instinctive discovery of ‘bounced’ shadow-less lighting to illuminate Bansi Chandragupta’s wonderfully realistic set of interiors of the family’s Varanasi residence perfectly mimics the light which Ray described as “qualitatively unvarying, and one could pass of a morning shot as an afternoon one” is acknowledged as a landmark in the history of cinematography. Often the protagonists are framed through doorways providing a visual metaphor to the themes of change, separation and closure. The balanced use of the evocative background music composed with traditional instruments by Ravi Shankar coupled with the imaginative use of immense variety of synchronous and non-synchronous sounds adds to the poetic quality of the film. A major part of the appeal of Aparajito lies in its perfect casting and the director’s ability to extract the very best out of a team of professional and non-professional actors. Kanu Bannerjee continues his excellent work as the meek and humble Harihar as does Pinaki Sengupta as the younger, innocent Apu. In an article, Extracts from a Banaras Diary, Ray described the shoot of Harihar’s collapse on the steps of Chowshati Ghat as “Very satisfactory work. A strong wind ruffled the surface of the river and lent movement to the shots. Kanubabu fell most realistically got a nasty cut in the knee.” Smaran Ghoshal in the role of adolescent Apu brings in all the energy and restlessness of youth. Karuna Bannerjee’s performance as Sarbojaya is the highlight of the film. A single movement of her face, a fleeting glance of her eyes is enough to express myriad emotions – pain, hope, despair, loneliness, love and the futility of waiting. The tendency of Italian neo-realist filmmakers like De Sica, Visconti and Rossellini – whose films Ray had seen regularly during his stay in London and inspired him – to use non-actors is reflected in Aparajito. Ramani Sengupta, “a seventy-year old resident of Banaras we picked up on the ghat” as Sarbojaya’s old uncle Bhabataran is a master-stroke in casting. The old man does a brilliant job in one of the final moments of Aparajito when he delivers a long dialogue counselling Apu to stay in the village and work as a priest while smoking his hookah. Subodh Ganguly, another non-actor, too is extremely convincing as the headmaster of the village school who kindles and nurtures the fire of curiosity in the student Apu. The influence of neo-realism can also be noticed in the film’s on-location shooting and conversational speech rather than literary dialogue. Aparajito, when released in 1956 following the immense success of Pather Panchali, was initially a commercial failure. 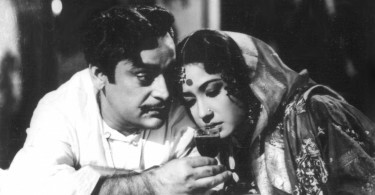 Ray admitted, “the urban audience which was largely familiar with the plot of Aparajito were irritated by the deviations. As for the suburban audience, it was shocked by the portrayal of the mother and son relationship, so sharply at variance with the conventional notion mutual of sweetness and devotion… the awards won by the film (at European film festivals) put a new complexion on the situation …” Among the prestigious awards the film has won are Golden Lion of St. Mark, Venice (1957), Cinema Nuovo Award, Venice (1957), Critics Award, Venice (1957), FIPRESCI Award, London (1957), Best Film and Best Direction, San Francisco (1958), International Critic’s Award, San Francisco (1958), Golden Laurel for Best Foreign Film of 1958-59, USA, and the Selznik Golden Laurel, Berlin (1960). Aparajito is a lyrical film imbibed with a deep sense of empathetic humanism. It narrates an emotionally resonant tale of movement and change as the key elements of human existence and captures the indomitable spirit of its protagonist who overcomes external constraints and overwhelming personal losses to continue his journey of life on his own terms. Like any great work of art Aparajito creates its own unique and sublime universe yet speaks to the hearts and minds of every sensitive individual.